Style Crescent: OOTD: Jumper and Docs. .Jumper: Charity Shop / Scarf: Car Boot / Bag: EBAY / High Waisted Leggings: Topshop / Sunglasses and Ring: Primark / Necklaces: Car Boot / Doc's: Serena's. Love the bag and your scarf too! I just found your blog through your youtube channel and I really love your style, it's so unique and edgy! Absolutely loving this scarf on you! Just makes the whole outfit pop! Love it! Love this outfit. 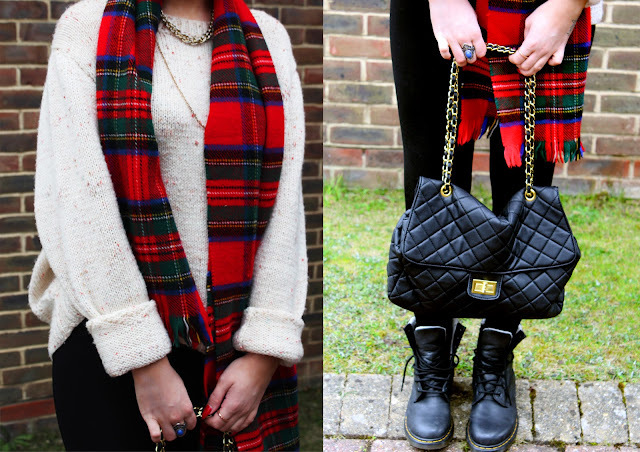 The scarf and jumper are gorgeous! Nice car boot and charity shop finds.